I have done this decoupage project a while ago, but I did not have time to write about it.Decoupage is one of my favorite crafts, along with crocheting, but it takes and time inspiration to do it. 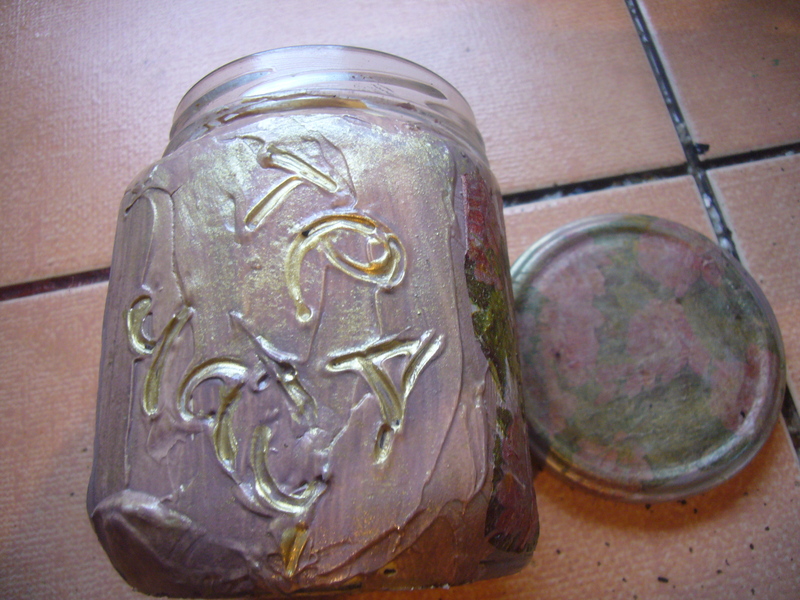 This tea jar decoupage is a very useful project, too. It’s a great way to upcycle things, such as old jars, glass bottles and even plastic bottles. I used to buy and store tea in paper boxes. But, with time the box would break down and the tea would fall out of it. Plus, dried tea does not ‘like’ light. It should not be exposed to light, when stored. So, I came up with this tea jar decoupage idea. 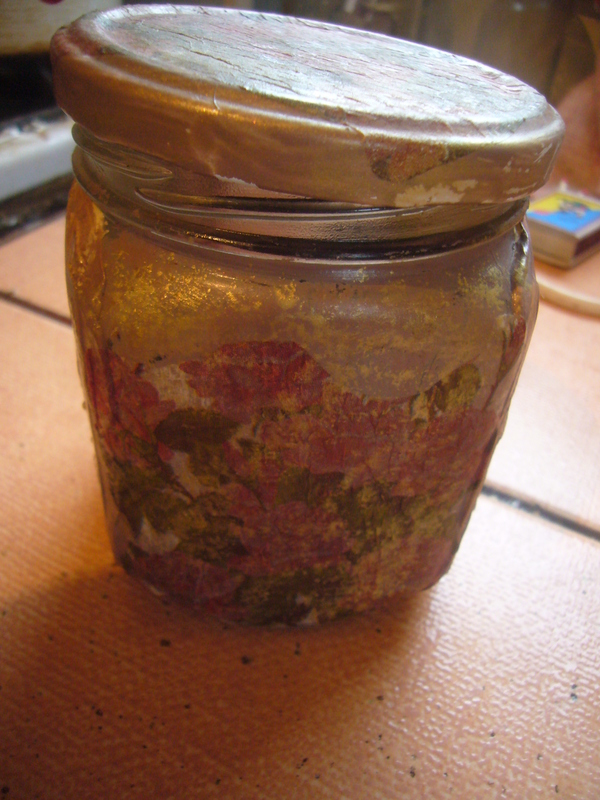 As you may see, I have partially decoupaged the glass jar. But I have also used a different approach to decorating it. I applied some wood putty onto the jar. When it was yet soft, I used my crocheting hook to write “Tea and Chai” on the jar. 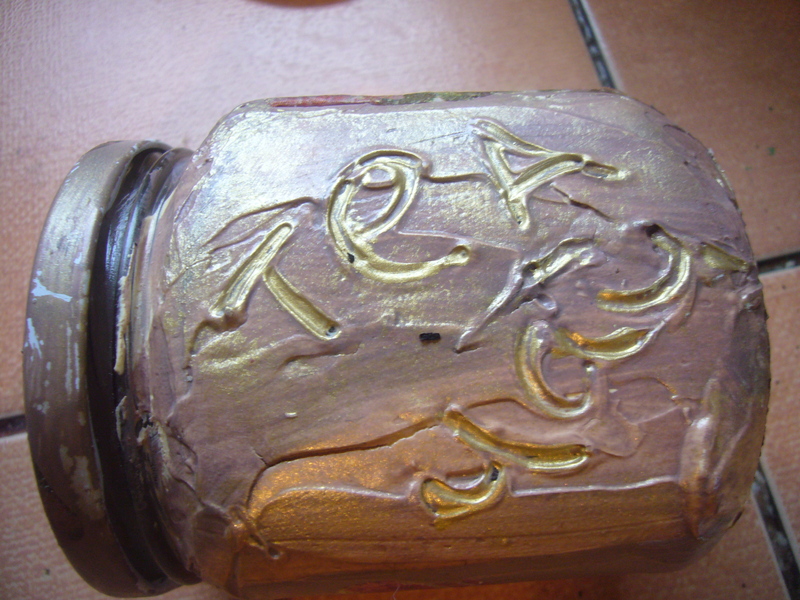 When the putty dried up, I painted it and highlighted the inscriptions with golden paint. I have also decoupaged the jar lid. Now my jar has become non transparent and well suited for storing tea. And, I love how it looks. All my friends tell me I have the most exquisite jars and bottles in my home:) That is what I love decoupage for. You can decoupage almost anything! This entry was posted in Decoupage ideas, Uncategorized and tagged crafts, creative tips, creativity, decoupage, decoupage how to, decoupage step by step, decoupage tips, DIY, do it yourself, glass decoupage, handmade, home decor, housekeeping, jar decoupage, tea jar decoupage, tips for moms, upcycling. Bookmark the permalink.